The validation system provides European patent applicants with a simple and cost-effective way of obtaining patent protection in Morocco. At the applicant's request, and on payment of the prescribed fee, European applications (direct or Euro-PCT) and patents can be validated in Morocco, where they will have the same effects as national applications and patents. The validation procedure is not based on direct application of the EPC but is governed solely by national law. These rules are set out in Section VI below. 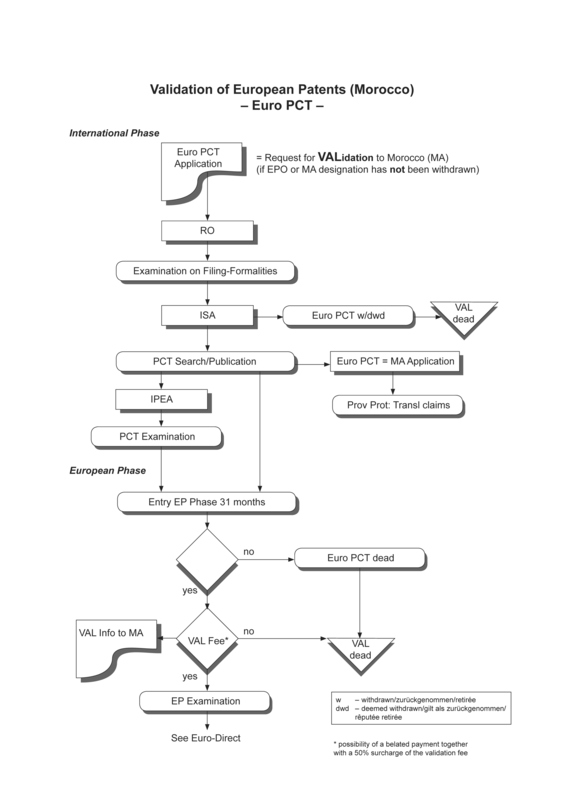 The flowcharts in Section VII are a handy guide illustrating the steps in the procedure for validation via the two filing routes. 1. Validation is at the applicant's request. A request is deemed to be made for any European patent application filed on or after 1 March 2015 (Article 50.2 of Law No. 17-97 and point 1, first paragraph, of the DG's notice). Validation is not available for applications filed prior to that date, or for any European patents resulting from such applications. 2. The EPO and OMPIC have agreed to fix the validation fee for Morocco at EUR 240, as published in the decision of the President of the EPO dated 5 February 2015. [ 5 ] It must be paid to the EPO (not OMPIC) within six months from the date on which the European Patent Bulletin mentions the publication of the European search report (Article 50.2 of Law No. 17-97 and point 2, first paragraph, of the DG's notice). (b) a two-month period from notification of a communication noting a loss of rights due to non-payment of the designation fee under Rule 112(1) EPC, in parallel with further processing on the designation fee. 4. No notification of non-compliance with the basic time limit or expiry of the grace period is issued. Nor is re-establishment of rights possible in respect of the periods for paying the validation fee. 5. The EPO's Rules relating to Fees apply mutatis mutandis to payment of the validation fee (point 2, third paragraph, of the DG's notice). The fee is specified in the schedule of fees and expenses published in the EPO's Official Journal. 6. If the validation fee is not paid in time, the validation request is deemed withdrawn (point 1, second paragraph, of the DG's notice). It is by paying the validation fee that applicants opt to validate their European patent application in Morocco. The declaration in Section 33.2[ 7 ] of the request for grant (EPO Form 1001, version 11.15) is merely for information purposes and is intended to assist in recording fee payments. 7. Applicants can withdraw their validation request at any time by informing the EPO accordingly. The request will also be deemed withdrawn if by final decision the European patent application is refused, withdrawn or deemed withdrawn (point 1, second paragraph, of the DG's notice). Validly paid validation fees will not be refunded (point 2, third paragraph, of the DG's notice). 8. If a European patent application is validated in Morocco, any European divisional application arising from it can also be validated. The validation fee in that case must be paid within the time limits prescribed in Rule 36(4) EPC. 9. Validation is also available for international applications under the PCT (point (a) in the annex to the DG's notice) filed on or after 1 March 2015, unless designation of the EPO and/or Morocco has been withdrawn. 10. The procedure for Euro-PCT applications is the same as for European ones, except that the validation fee upon entry into the European phase must be paid to the EPO within 31 months from the filing date (or earliest priority date) or within six months from the date of publication of the international search report (ISR), whichever is more recent (Article 50.2 of Law No. 17-97 and point 2, first paragraph, of the DG's notice). 11. If the application enters the European phase early, before the end of the 31-month period under Rule 159(1) EPC, the applicant must fulfil the entry requirements as if that period expired on the date of the request for early processing. Thus payment of the validation fee depends on when early processing is requested – i.e. has the time limit for paying it already expired on the date the request is made? If, on that date, the ISR has not yet been published, the validation fee can still be paid within six months from the date of the ISR's publication. 12. Under Article 50.1 of Law No. 17-97, a European patent application for which the validation fee has been paid is equivalent to a regular national application, and after publication confers provisional protection under Article 50.3 of Law No. 17-97, provided the applicant files the claims with OMPIC in Arabic or French and pays the prescribed fee. OMPIC will publish these claims. 13. Once the EPO publishes the mention of grant, a European patent validated in Morocco has the same effects as a national patent (Article 50.1 of Law No. 17-97), provided that within three months of that publication the proprietor files an Arabic or French translation of the claims with OMPIC and pays the prescribed fee (Article 50.4, first paragraph, of Law No. 17-97). Proprietors will have a further two months to file this translation if they have submitted a request for further processing to OMPIC (point 3, first paragraph, of the DG's notice). 14. Under Article 50.4, paragraph 2, of Law No. 17-97, if the translation of the application or patent confers narrower protection than the text in the language of the EPO proceedings, then the translation will be the authentic text – except in revocation proceedings, which will be based on the language of the EPO proceedings. 15. Point 6 of the DG's notice covers cases of conflict between European and national applications or patents. It corresponds to Article 139(1) and (2) EPC, and makes clear that for subsequent Moroccan applications an earlier European application validated in Morocco has the same prior-art effect as a national application. However, it only has such effect if the validation fee has been paid, thereby ensuring that not every European application counts as a prior right. The same applies mutatis mutandis if an earlier national application is prejudicial to a later European application validated in Morocco. 16. If a patent validated in Morocco is subsequently amended in opposition or limitation proceedings before the EPO, OMPIC will publish and record the relevant information in the Moroccan register (point 4 of the DG's notice), without requiring that the proprietor complete any formalities. 17. The effects of validated European patents and applications can lapse retroactively. For example, the provisional protection conferred by a published European application will be lost ab initio if the validation request subsequently lapses (Article 50.3, third paragraph, of Law No. 17-97). Similarly, to the extent that the patent granted for the application is revoked in EPO opposition or revocation proceedings, that provisional protection and the patent's effects will be lost ab initio (Article 50.4, fourth paragraph, of Law No. 17-97). 18. Renewal fees for validated European patents are payable to OMPIC (not the EPO), under the provisions governing national patents, for the years following that in which mention of grant of the European patent was published (point 5 of the DG's notice). 19. The Moroccan provisions on revocation of national patents apply to validated European patents. The grounds for revocation in Article 85 of Law No. 17-97 largely correspond to those in Article 138 EPC. 20. The European Patent Register gives details about the validation of European patent applications and patents, recording the states for which validation has been requested and the relevant fee paid, and the lapse of any validation request already published in the register. The European Patent Bulletin and the patent documents published by the EPO also mention any validation of European applications and patents. 21. Once the validation fee has been paid, the EPO will inform OMPIC of the European applications for which validation has been validly requested. OMPIC will publish this information as soon as possible, but no earlier than 18 months from the relevant priority date (Article 50.2, second paragraph, of Law No. 17-97 and point 1, second paragraph, of the DG's notice). Lapses of validation requests will be published if details of the validation have already been published. 22. OMPIC will also publish the translations of the claims of validated European patents filed by the applicant under Article 50.4 of Law No. 17-97, and make known their subsequent fate in accordance with the provisions governing national patents. 23. For the purposes of validation, the EPO acts purely on the basis of the validation agreement with Morocco. The procedure itself and the legal effects of validation are governed solely by Moroccan law (point 7 of the DG's notice). 24. Since, therefore, any EPO action relating to validation is not taken by virtue of the EPC and is instead subject to national law, the EPC provisions on legal remedies and appeals do not apply. Article 50.1 – At the applicant's request, and subject to the provisions set out below, a patent application filed with or patent granted by an industrial property authority of a state, or community of states, designated by law – hereinafter "validation authority" – will have the same effects, and be subject to the same conditions, as an application or patent duly filed with the Moroccan industrial property authority. Article 50.2 – Validation requests must be filed with the validation authority and are subject to payment of the prescribed fees. On expiry of an 18-month period from the filing date or, if priority has been claimed, from the earliest priority date, the Moroccan industrial property authority will publish the validation request without delay, once informed by the validation authority that the prescribed fees have been paid. Article 50.3 – At the request of the applicant or his representative, and subject to payment of the prescribed fees, the Moroccan industrial property authority will publish in Arabic or French the claims of the application filed with the validation authority. In accordance with Article 44 above, publication of these claims will confer on the applicant the provisional protection provided for in Article 51 below. Such protection will be lost ab initio if the validation request is withdrawn or deemed withdrawn or if the validation authority refuses the application. Article 50.4 – To enjoy protection under this law, the proprietor or his representative must file with the Moroccan industrial property authority, within three months from the date of publication of the granted patent by the validation authority, the claims in Arabic or French and pay the prescribed fees. If the translation of the application or patent confers narrower protection than the text in the language of the proceedings before the validation authority, then the translation will be the authentic text – except in revocation proceedings, which will be based on the language of the proceedings before the validation authority. The Moroccan industrial property authority will publish the claims of the validated patent referred to in the first paragraph above. The protection referred to in the first paragraph above will be lost ab initio if the validated patent is revoked in proceedings before the validation authority. Article 50.5 – The renewal fees for validated patents are payable to the Moroccan industrial property authority in accordance with Article 82 below. Article 22.1 The validation authority within the meaning of Article 50.1 of Law No. 17-97 will be designated by order of the governmental authority responsible for industry. The European Patent Office is designated as validation authority within the meaning in Article 50.1 of Law No. 17-97. This order will be published in the Official Bulletin. Under its innovation strategy to improve its patent system by taking account of international best practice and the interests of innovative firms and other users of industrial property, Morocco has introduced a procedure for validating patents granted by a recognised validation authority. This procedure is governed by Law No. 17-97 on the protection of industrial property, as amended and supplemented by Law No. 23-13, and the related secondary legislation. Under this legislation, the European Patent Office (EPO) is recognised as validation authority. At the request of the applicant to the EPO, European patent applications and the resulting patents can therefore be validated in Morocco. This information notice sets out the arrangements for the validation procedure under the applicable legislation. A request for validation is deemed to have been submitted with the EPO for any European patent application filed on or after 1 March 2015. Validation requests submitted to the EPO may be withdrawn at any time. They will be deemed withdrawn if the prescribed fee is not paid in time, or if by final decision the European patent application is refused, withdrawn or deemed withdrawn. OMPIC will publish any information on withdrawal as soon as possible if it has already published a mention of the request under Article 50.2 of Law No. 17-97. The validation fee must be paid to the EPO within six months from the date on which the European Patent Bulletin mentions the publication of the European search report or, where applicable, within the period for performing the acts prescribed for an international application to enter the European phase (Article 50.2, first paragraph, of Law No. 17-97). The validation fee can still be validly paid within a two-month grace period from expiry of the relevant period referred to in the previous paragraph. In such cases, a late-payment fee is payable to the EPO. The EPO's Rules relating to Fees apply to payment of validation fees, which cannot be refunded once validly paid. The validation fee is fixed by joint agreement between the EPO and OMPIC. It is currently EUR 240. Where the translation required for validating a European patent is not filed within the prescribed three-month period from the date on which the EPO publishes the granted patent (see Article 50.4 of Law No. 17-97), proprietors will have a two-month grace period to file it if they have submitted a request for further processing to OMPIC. If the claims are not filed or the prescribed fees paid in time, the validated European patent will be deemed null and void ab initio. OMPIC publishes and records in the register any mention of an amendment to a validated patent made during proceedings before the EPO after the patent has been validated in Morocco. The prescribed renewal fees are paid to OMPIC for the years following that during which the mention of grant of the European patent was published, in accordance with Articles 82 and 50.5 of Law No. 17-97. European applications for which a validation fee has been paid and validated European patents will be treated as having, with regard to national applications or patents, the same prior-right effect as a national application or patent, in accordance with Article 55(g) of Law No. 17-97. Similarly, in terms of their prior-right effect with regard to validated European patents, national applications or patents will be treated as they would be with regard to a national patent. The entire validation procedure introduced under the validation agreement is subject to national legislation and regulations. (d) "date of publication of the granted patent" means the date on which mention of the grant of the European patent is published in the European Patent Bulletin. [ 1 ] OJ EPO 2015, A20. [ 2 ] Law No. 17-97 on the protection of industrial property, as amended and supplemented by Law No. 23-13 promulgated by dahir No. 1-14-188 of 27 moharrem 1436 (21 November 2014) published in Morocco's Official Bulletin (OB) No. 6318 of 18 December 2014 (publication in French: OB No. 6358 of 7 May 2015). [ 3 ] Decree No. 2-14-316 of 23 rabii I 1436 (29 January 2015) amending and supplementing Decree No. 2-00-368 of 18 rabii II 1425 (7 June 2004) implementing Law No. 17-97 and published in OB No. 6333 of 9 February 2015 (publication in French: OB No. 6358 of 7 May 2015). Order No. 15-162 of 30 January 2015 issued by Morocco's Minister for Industry, Commerce, Investment and the Digital Economy, designating the EPO as validation authority and published in OB No. 6333 of 9 February 2015. 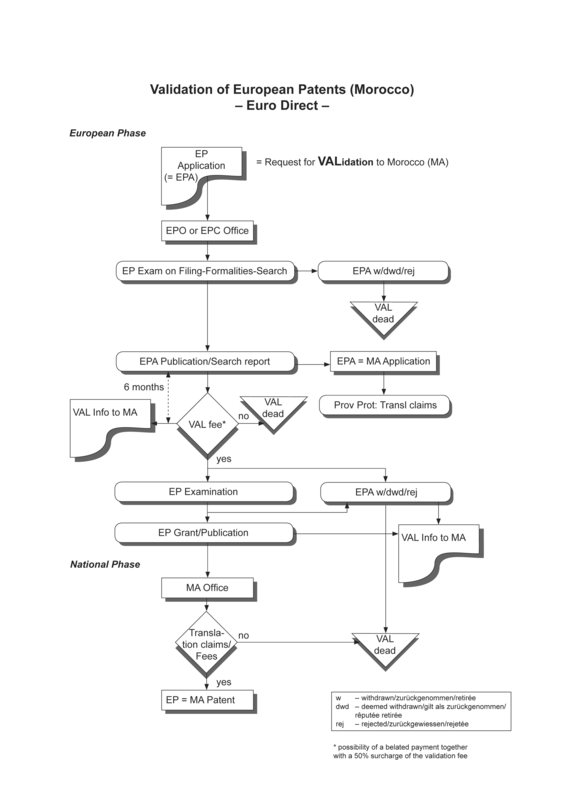 [ 4 ] This notice about the procedure for validating European patents in Morocco was published on OMPIC's website on 19 January 2015. [ 5 ] OJ EPO 2015, A18; point 2, third paragraph, of the DG's notice. [ 6 ] Notice from the EPO dated 5 February 2015 concerning the time limits for paying validation fees (OJ EPO 2015, A19) – same procedure as for the grace period for paying extension fees (OJ EPO 2009, 603). [ 7 ] Applicants must indicate there whether they intend to pay the validation fee.